Bombardier Rotax 250cc 2 stroke - Charcoal Gasification - Drive On Wood! The Kawasaki i tried before, never passed the stage of engine overhaul, the new piston / bore was ill aligned so it ended in the scrap. We had a steel wheel mountain gras cutter with a 250cc Rotax 2 stroke just like that one. Good engine. Slow turning, a good chargad candidate. Keep us posted on how you plan it with injecting oil. In the back of my mind is a snowmobile on chargas… I’ll be looking in on this one Koen! Rotax engines are quite impressive. 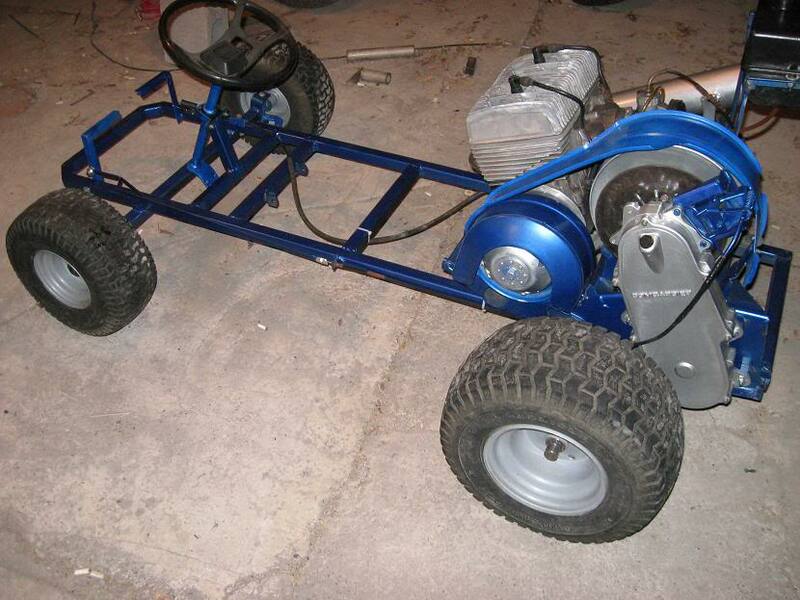 I once built a mini go cart/dune buggy for the kids that was waaay faster than you want kids to travel. Take off with 3/4 throttle and there was no way to keep that thing going straight. You would be amazed at what crazy snowmobilers will do. They do water crossings with them. Not my world but two stroke rotax engines are common… I was thinking of finding one with oil injection built in to avoid the headache. Detroit Diesels are two stroke and they have an oil sump. With that in mind I wonder if you could convert to splash lubrication. I’ve always wondered if you could run a 2 stroke on tarry gas with no valves to stick? 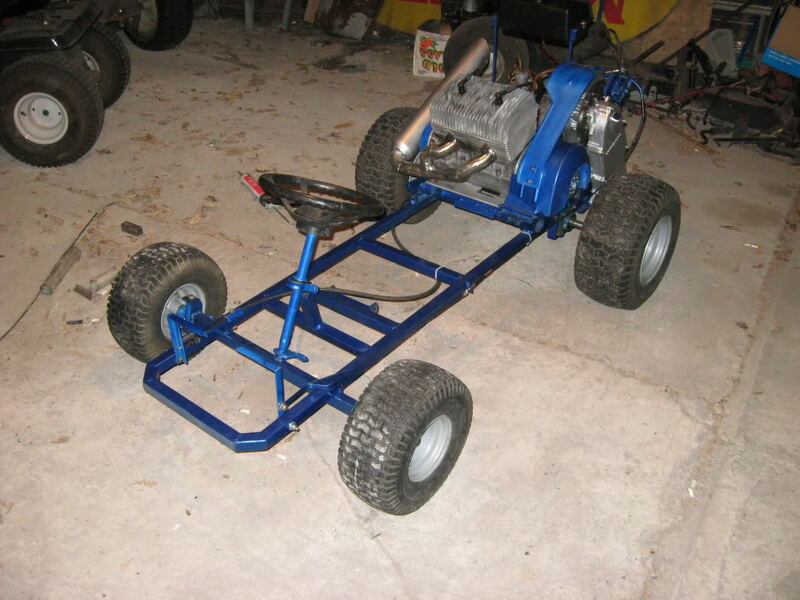 Here’s a pic of a kart I built for my kids years ago. I used a free air 340 Rotax twin, along with the sled’s CVT and reduction box. It was a rocket! My first woodgas engine was a 2 stroke 50cc moped. I was a young woodgas enthusiast and run the litle “coffe grinder” motor with a restrictionless gasifier sized for a engine about 20 times biger. And it run on pelets long story short, the engine sucked so much tar and moisture it glued the piston to the bore while runing at full load. You can imagine what the inside looked like. Anyway, l took it apart, cleaned eith alcohol and the engine still runs today, on charcoal. If it was a 4 stroke l think there is 0 chance it got out unharmed after a pint of tar inside. I think 2 strokers have not yet ben exployed enough with woodgas! I think 2 strokers have not yet ben exployed enough with woodgas! I have thought about putting spark plugs in a Detroit Diesel. Easy to lower the compression with turbo pistons but I think they are also too high. Some day I’ll look that up. Of course the Roots blower would not like tar. Second thought, me stick to gas engines. I am confused, all of the two strokes I am familiar with get internal lubrication from oil mixed with the gasoline. If you substitute charcoal how do you lubricate? Even if it has oil injection I wouldn’t think it would be compatible with charcoal gas. We may not need to worry about the compression ratio since producer gas has been used at least up to 17:1 without difficulty. Converting to spark ignition has been done, but 15% diesel fuel is enough to keep things running on CO without spark. If this is respected, there are no reasons not to use a 2-stroke engine. The power loss might be a little bit bigger than for a comparable 4-stroke engine. Looking forward to see the Rotax running on chargas! I would hook up my snowmobile to a gasifier. My worry is that it is liquid cooled and the clutch doesn’t engage until 5000 rpm’s. I believe it idles at around 1000 rpm’s. My Polaris is oil injected, so I don’t think there will be worries there. I worry about what size restriction to use? You are right, but dont forget a 2 stroker already has a 1,5 more the power per displacement compared to a 4 stroker. Bill, why do you say water cooling is a problem? The 5000 rpm min. is a bit tricky. Specialy for chargas. But you culd hack the clutch variomat with different weights, to ingage sooner. My problem with two stroke on woodgas is not that it has any technical problem with working, but the idealism of biofuel. Quite possible they also can’t get mixing oil. Or if it is the environmental concerns, also gasoline and oil are extracted from the same resource. Also the burning of the oil produces unwanted toxins in the exhaust. For Emissions I’m on the same page. I dont see a problem with the greenieness of 2 strokes compared to 4 stroke though. In a 4 stroke the lubrication is an oil product that once dirty is disposed of so how is it different from 2 stroke oil? You burn it up instead of change it. I know stihl makes a biodegradable 2 stroke oil and marine ones tend to have the option as well. I’m toying with buying a sled so this topic is, well, topical. Yes, but I mean the percentage of power loss of the original petrol-power might be higher for a 2-stroke-engine, mainly due to less sucking action and thus a lower level of generator gas fed in the engine. Usually 2-stroke engines get the same power at lower revs than a 4-stroke in the case of “working-horses”, or higher power at higher revs “race-horses”. I disagree in some respects. You need engine oil for a 4-stroke engine and for your transmission as well. OK, this could be more easily recycled and filtered, as it is not burned or lost. And there are some special mixing oils for marine engines or chainsaws which are biodegradable. With good oils, you can easily reduce the mixture ratio. I did this on my 2-stroke motorcycle from the 70s. Originally 1:50, I used 1:75 with no problems at all, but much less smoke. 1:100 with modern engines and oils are no problem, some run even with 1:200 for water cooled engines with special oils. With the emissions: If you would put the same effort for low emissions (catalytic converter, petrol injection, …) in a 2-stroke than in a 4-stroke, there is not much difference.